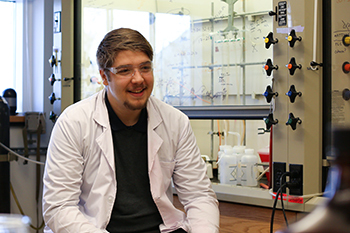 Roarke Tollar ’20 was about four years old when he ruined his grandfather’s carpet with the blue foam of a chemistry set. “I liked mixing stuff and watching things happen,” he said. When he began having doubts about his faith, he turned to science for answers, and wondered what would happen. Q: What happened with your faith that led you to science? A: I grew up Christian. But when I was around 12, I started realizing that I had prayed to God my entire life but hadn’t heard a single thing in response. What was going on? I would go to camps and keep reaffirming my faith, trying to convince myself it was true. But if God really cares about us so much and seems to want us to understand him, then why don’t we ever see anything or hear anything in response? At first, my answer was that there was no God. But I couldn’t prove that either. So the answer was to cling to anything I could prove, and my answer was science. I figured that the closer I could get to understanding the world, the closer I could get to understanding the one who created it. A: Right now, I don’t think there’s a way to prove that God does or does not exist. So the best thing we can do, I think, is to understand the natural world. And chemistry, essentially, is the study of really small things that make up really big things around you. So if you can understand the little things, then you can understand the big things. 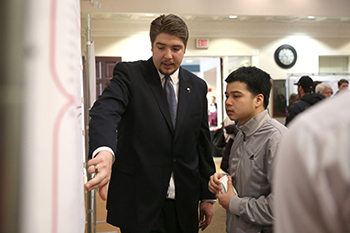 Q: How has Wabash helped you throughout this process? 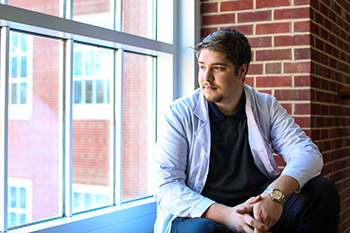 A: I would be a completely different person if it wasn’t for Wabash—and probably for the worse. I was really lost as a high school kid. I didn’t know what I wanted to do; I just knew I loved chemistry. I was also really depressed because of my faith. Wabash taught me to consider both sides of the story—to analyze things critically and not to give up just because an answer’s unclear. I guess you can say I found a sense of hope. Q: What do you hope that the answer is—that there is a God? A: Yeah! For sure! I don’t want this to be it. I don’t think anyone does. And I still adhere to Christian values, even though I don’t really know what I am now. I think loving thy neighbor is a good message people should listen to. I just don’t like how people say you can feel God’s presence, when really I think that’s just a psychological thing that people like to convince themselves of. I just don’t buy that aspect of it. I wish I could. Q: While you’ve been exploring your faith through chemistry, you’ve also been producing a lot of research. You won two awards last year at Awards Chapel and worked with Dr. Wysocki this past summer. What was that like? A: It was a great summer. Dr. Wysocki is a brilliant professor who’s also really nice and fun to work with. But honestly? It was intimidating at first. Our professors are so smart and know exactly what they’re doing. Sometimes I felt like, “Oh my gosh. How will I ever get to this level?” But once I remembered that they’re 15-20 years ahead of me, I got a lot out of the relationships. But at the same time, it’s also really nice being around all of that knowledge. They’re the people I want to be like when I grow up academically, so I feel like it accelerated my learning and helped me gain a lot of experience. I’m now doing an independent study with Dr. Howland that looks at universal patterns that exist in many different fields of study. I’m only two weeks in, but I’m constantly making new observations. I think that my studies have helped me understand certain aspects of the principles that drive our universe, but in terms of faith, I don’t think I’ll have that figured out anytime soon. A: I want to pursue an M.D. My goal was and still is to understand human existence through science, but I’ve recently come to gain great appreciation for using knowledge gained through the practice of science to save lives. I think that science and religion go hand-in-hand in the field of medicine, which is what I’m looking for. I want something that can satisfy my craving for God and for rigorous science and learning. I absolutely love the rigor of Wabash, and I know that I can’t do anything that doesn’t keep me at least this busy. When I picture myself helping save lives, I get a warm, exciting feeling in my chest and a big, stupid grin, so I think I’m going down the right path!